Windows Media Player 12 brings small yet handy improvements which have turned it into a powerful multimedia center for music, video and photos. Designed by media lovers, for media lovers. 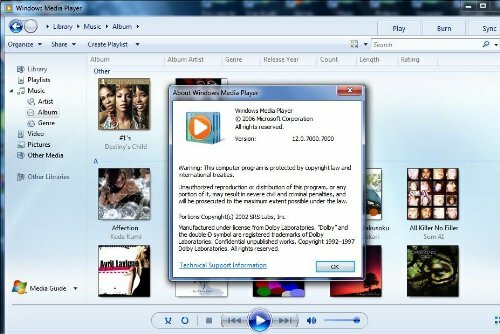 Windows Media Player 12 plays more music and video than ever—including Flip Video and unprotected songs from your iTunes library! 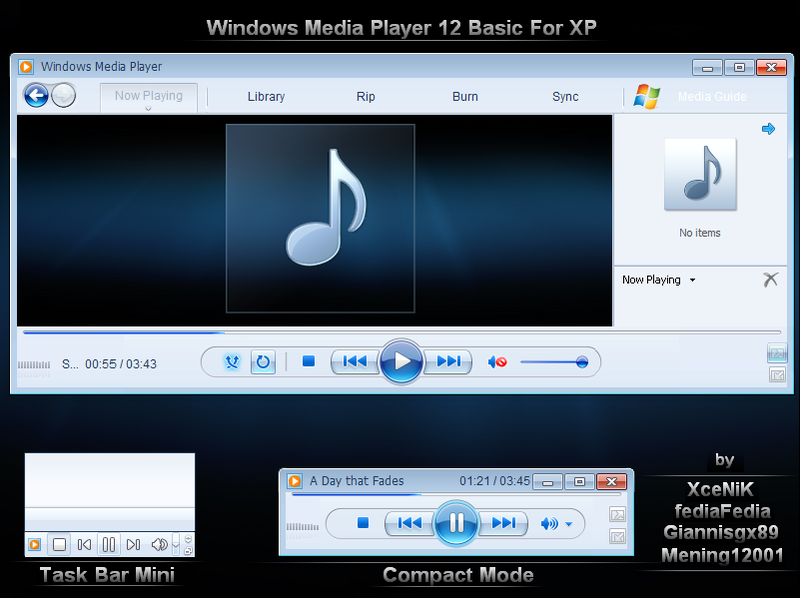 Windows Media Player 12 is the latest version of Microsoft's official media player, which comes bundled with Windows 7. It's not that different from version 11 – except for some slight changes in design – but if, like me, you haven't used Windows Media Player for a while, you'll be surprised to find a full multimedia suite with which you can not only listen to your favorite bands, but also view pictures, watch videos, rip and burn CDs, sync with mobile devices and even buy music online. Windows Media Player 12 maintains the same design of the previous version, featuring only small changes in color (now it's clearer and brighter) and toolbar layout. The program now makes a clear difference between the Library mode – which shows the Library contents and tools - and the Now Playing mode, where you can see the currently active song, video or playlist, along with visualization effects. All Windows Media Player 12 reviews, submitted ratings and written comments become the sole property of Windows 7 download. You acknowledge that you, not windows7download, are responsible for the contents of your submission. However, windows7download reserves the right to remove or refuse to post any submission for any reason. Windows 7 Download periodically updates pricing and software information of Windows Media Player 12 full version from the publisher, but some information may be out-of-date. You should confirm all information. Using warez version, crack, warez passwords, patches, serial numbers, registration codes, key generator, pirate key, keymaker or keygen for Windows Media Player 12 license key is illegal and prevent future development of Windows Media Player 12. Download links are directly from our mirrors or publisher's website, Windows Media Player 12 torrent or shared files from free file sharing and free upload services, including Rapidshare, MegaUpload, YouSendIt, SendSpace, DepositFiles, DivShare, HellShare, HotFile, FileServe or MediaFire, are not used. Note: Available only in Windows 7. Windows Media Player 12 comes as part of Windows 7 and is not available as a separate download. Check out the Top 10 reasons to buy Windows 7. It`s very nice to have this kind of access to such a software. I really appreciate it.